The movement of yellow vests is being discussed across different latitudes and time zones. 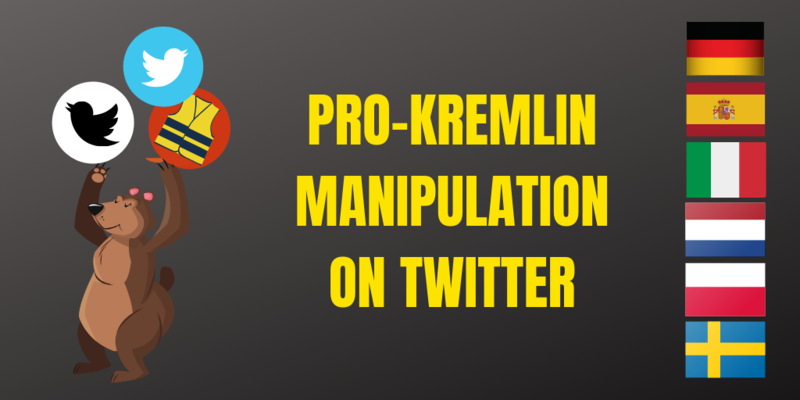 While evoking a wide spectrum of emotions, it also attracts pro-Kremlin outlets such as RT and Sputnik, who are known to spread disinformation and deepen divisions across wide range of audiences and languages, like reported by euvsdisinfo.eu. Kremlin’s role in amplification of the calls for violent protests is being investigated by the French authorities. Involvement of pro-Kremlin outlets in heating up discussions on the yellow vests has been already shown; however, these activities are not limited to the French audience. Since November 2018, we have been collecting evidence of pro-Kremlin disinformation surrounding yellow vests in the EUvsDisinfo database in different languages. Now we decided to complement the research by looking into the social media. We analyzed conversations about the yellow vests protests on Twitter in six languages: German, Italian, Spanish, Dutch, Polish and Swedish. By using a research model of the Atlantic Council and the Oxford Internet Institute, EUvsDisinfo checked if traffic on Twitter in this discussion was manipulated or natural. The formula which helps to see that involves numbers of tweets, unique users, retweets, and the share of retweets by the most active accounts. The result takes form of the so-called Coefficient of Traffic Manipulation (CTM). According to this method, a non-manipulated Twitter trend gets a CTM below 12. In other words, even though manipulation is not always easy to spot, a number below 12 would mean that a Twitter discussion was natural. For instance, a word ‘Friday’, searched for last September, got a CTM of 7.67, whereas the #4thofJuly hashtag – 8.78. If the CTM is higher than 12, it might means two things. Firstly: that the discussion was manipulated to go in a desired direction. Secondly: that this manipulation was successful. What’s in your Twitter bubble? The results of our research came as a shock. Online discussions on yellow vests in six researched languages from 10 November 2018 to 10 April 2019, reached the levels from 13.2 to 43.2! The highest scores were reached in the Swedish, Dutch and German Twittersphere. Yet even the lower indicators, between 13 and 20, do point out significant manipulation of Twitter conversations. As yellow vests protests are intensively covered by the Western media, there are plenty information about them, in all languages. In discussions on Twitter, links and threads from the media intertwine with disinformation messages. Nevertheless, in nearly all languages we researched (except for Polish), they are among the twenty most shared domains. In Spanish and German-language discussions on Twitter, RT is the one with most shared links about yellow vests. What do all those numbers mean? Well, if you thought that pro-Kremlin disinformation doesn’t concern you because you do not speak Russian or you do not follow discussions in Russian – you got it wrong! The disinformation surrounding yellow vests spreads way beyond the French language. It can target your Twitter bubble, too. And if you are discussing the yellow vestsprotests in one of the six languages we have looked into, you may well be talking not to the people interested in an actual conversation, but to automated pro-Kremlin bots, whose aim is to manipulate, distract and amplify the high-jacked discussion.